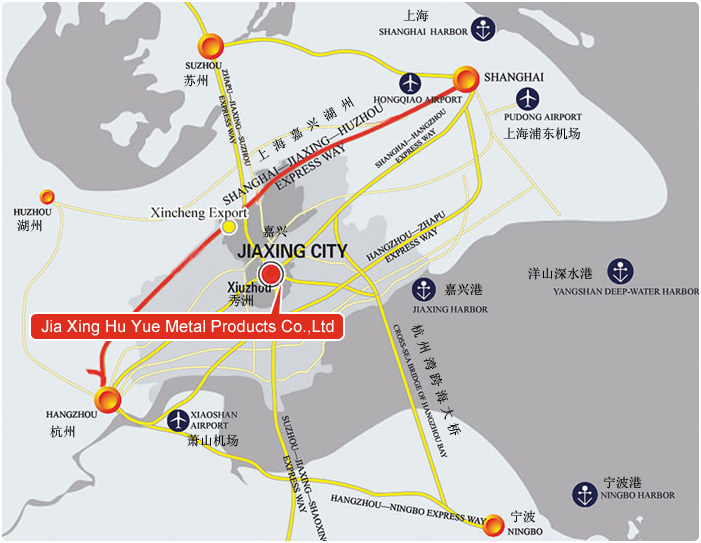 Hu Yue Metal products is located in Xinfeng town of Jiaxing, which is called the village of metalwork. Jiaxing is in the east of China, with about half million population and long history of metal manufacture. Our city is in the center of the high way between Shanghai and Hangzhou. From Shanghai Pudong airport to Jiaxing is around 100 km and it will take about 1.5 hours by car , the same if you go from Hangzhou. For more information, please refer to the map below. Copyright © 2010-2011 Jiaxing Hu Yue Metal products Co.,Ltd All rights reserved.